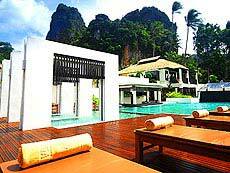 Railay Beach is located 5km South from Ao Nang Beach at the base of Phra Nan Peninsula. Isolated from mainland and only asscessible by boat. 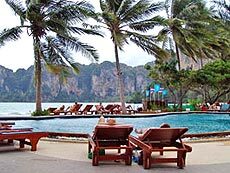 Railay West Beach is the main sandy beach with nice view of limestone mountains view. 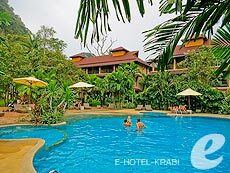 Most of popular resorts are on this beach, Railay East is the other side of the Peninsula, which has shalow rocky beach with mangroves. More quiet and natural atmosphere. 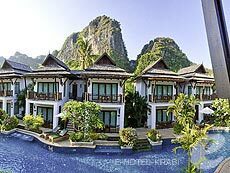 Railay Princess Resort and Spa is situated at the middle of Railay Peninsular, between West side and East side of Railay. Certainly, this is not a beach front resort, however, offering deluxe accommodations with the pool view. 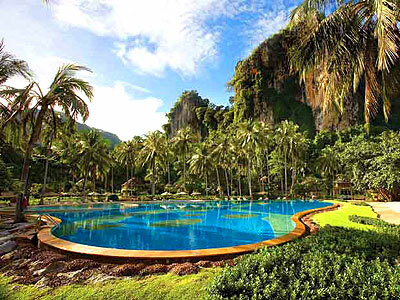 You will enjoy seeing the most beautiful tropical landscape with silence.